Jane's Box of Colours: Some Maggies got inky!! Oh boy, why is it that so many must have stamps arrive in the post only to be hidden away in a storage box and stay there without seeing a drop of ink................................ the shame!! 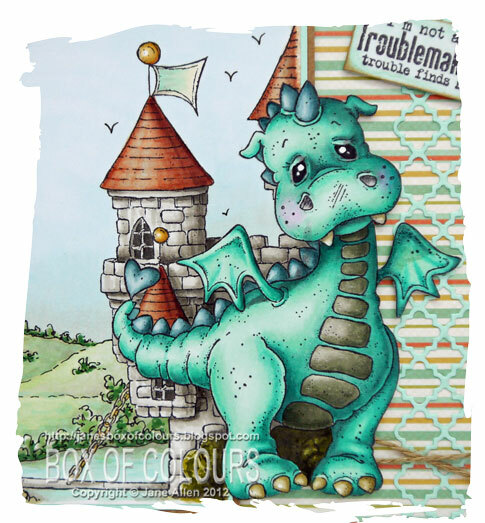 As soon as I saw this little dragon I knew she had to join my collection, in fact I splurged on quite a few of the stamps in this particular release! Here is Lillyrose in for her close up. Have you noticed that sometimes your images look a little fragmented - no I do not mean your masking has gone wrong, just that the colours of objects within your project seem to fight with one another for attention and the whole picture fails to gel? Try this - because I wanted Lillyrose to be the focal point, but not completely overshadow the castle I incorporated her body colours throughout the image - can you spot where? 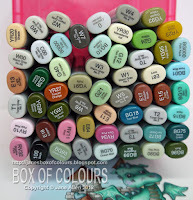 For those of you who like to know which Copics I used brace yourself - there are quite a few!! For those of you that said "flag" - well done. But did you spot it in the scene I doodled behind the castle, in both the moat and grassland. What about the castle rooves - it helped tone down the redness which was drawing my eye away from the dragon and yes I even added a little BG10 to the castle walls too. How many did you manage to spot? OMG this is just fantastic I love the overall design and my word what fabulous colouring and shading just love how you have used the colours to blend so perfectly but then your colouring is awesome!! I have the dragon and still not coloured her up think I need to get her out now!!! Beautifully done! Love your colour choices and that dragon looks adorable. I'm with you Jane, why are so many of my stamps still waiting to meet ink? Love the scene and you'd never know that was a doodled scene, looks like part of the stamp to me. Have to confess, got the same and in the doodling but missed the blooming roof, doh! Fabulous colourwork and love, love the whole scene you created. Fabulous card, Jane! I love the sentiment with this dragon. I totally agree with you. I have so many stamps that haven't seen any ink. Must stop buying until I've stamped the ones I have! Wow.. absolutely fabulous. I love your coloring, just delighful. Hugs. Wow, I keep going back to gaze at this. Love the lattice being the colour of the dragon, good idea, I may have to borrow it. Thank you for cooking it up with Katie. Fabulous coloring and designing Jane! love it! yup, totally agreeing with the stamps thingy, sooo many beautiful stamps that havent seen ink. and i think with the coming of digistamps im getting even worser at using my rubbers, hmmm...so wierd, but it feels like its going faster to print. anyways, i got your message on my blog. It did go thru hun, thank you so much. I totally adore your coloring and the rest of the card is as beautiful as they always are. have a wonderful saturday sweetie! Absolutely Adorable! Love the scene. I have to order that dragon for my son:) thank you for joining us at All That Scraps this week. WOW! this is absolutely fabulous Jane! What superb colouring of this adorable image, and I love the stripy paper! 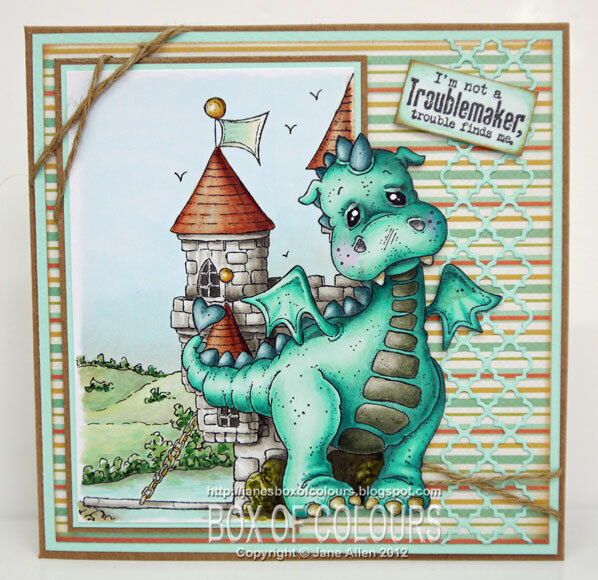 Awww this is such a sweet dragon and the castle in the background looks amazing. Thanks for the tip about the body colour! Very cool! Wonderful scene you've created and colored. Thanks for joining us at DYSU. ah what a lovely scene card! the coloring of the dragon is superb! Thanks for joining us at DYSU. This is a beautiful card. Really love how You've layered it all together. Love the dragon!